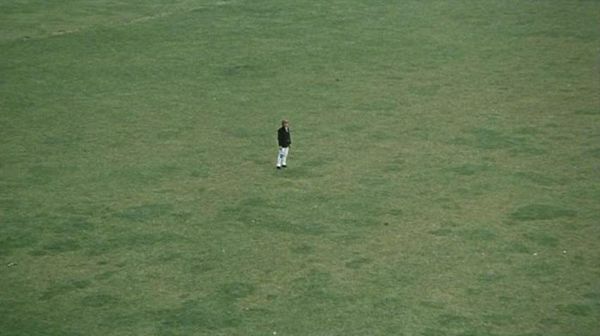 If I was asked to suggest a particular sound that defined London through its cinema, it would not be the bustling noise of traffic or an iconic piece of soundtrack music; it would, in fact, be the very simple but endlessly mysterious sound of the wind rustling through the trees in Michelangelo Antonioni’s Blowup (1966). Having visited all of the locations of the film last summer for the British Film Institute, it was a surprise to find, when visiting Maryon Park in Charlton where much of the film’s famous park sequences were shot, that Antonioni and his sound recordist, Robin Gregory, had merely emphasised something that was already there rather than created an impressionistic illusion of diegetic sound. It is through this emphasis, and its grounding in a very particular reality, that I believe much of the power of these sequences in the film is derived and is worth exploring in what is an endlessly analysable film. In narrative terms, the park sits at the heart of the film, though ironically is geographically at the very edge of the rest of the film’s action in reality. 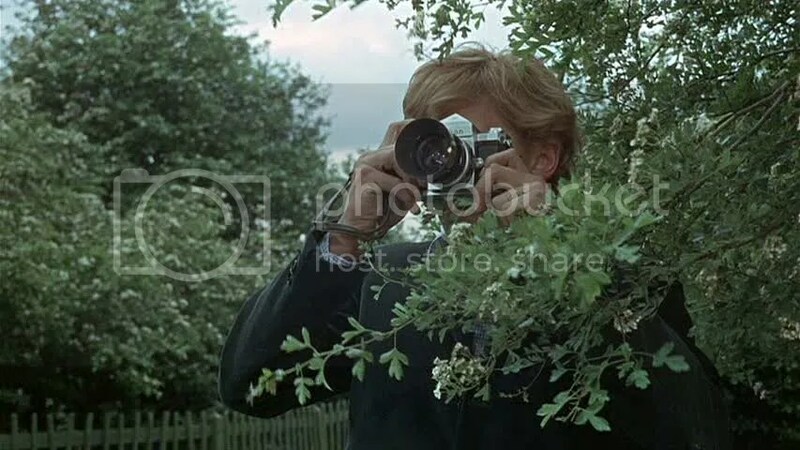 Thomas (David Hemmings), a photographer, pays a fleeting visit to the park after perusing in a nearby antique shop. He slowly ghosts the footsteps of a pair of lovers whom he photographs, only to be confronted by the woman, Jane (Vanessa Redgrave), who doesn’t want the photos developed. The film revolves around the back-and-forth journey for these photos before Thomas realises that he has accidentally captured a murder. He then visits the park several times, first finding the body of the murdered man and then finding it disappeared before finally disappearing himself after a watching a group of mimes play tennis. The park is the narrative vortex of the film with each visit spitting the characters back out as irreparably changed, even when they do not realise such a change to have taken place. For all of these moments in the park, the sound of the wind rustling through the trees is heightened, being almost the only sound to actually occur there apart from the occasional snap of Thomas’ camera and the final game of mime tennis (which, itself, is a puzzling moment in that an imaginary game eventually produces real sounds). In a sense, the soundscape hints towards an otherness in the space, one that is away from the hectic noise of Yardbirds gigs, fashion shoots and drives around Notting Hill streets. It sets a new context for the visual, which is already contrasted due to the incredibly green tones of the visual, almost certainly heightened by Antonioni who usually augments his film spaces through explicit physical means (for example, painting trees and tidying paths). For a film with a notably famous soundtrack performed by Herbie Hancock, its absence in all but the film’s very final moment in this space raises questions about what this sound of the breeze in the trees is doing to the film as a whole. In Julio Cortázar’s original story, the nature of the wind gets a mention and, though the original story is set in Paris, it’s worth quoting as it at least highlights its deliberate inclusion in the story: “It’s rare that there is wind in Paris, and even less seldom a wind like this that swirled around corners and rose up to whip at the old wooden Venetian blinds behind which astonished ladies commented variously on how unreliable the weather had been these last few years.” (1964). It seems that Antonioni ran with this aspect but one that the character of Thomas initially sees as representing some sort of peace and contentment. When he mentions the photos he’s taken in the park to his manager, Ron (Peter Bowles) (albeit and importantly before he has developed them and seen what’s on them), he mentions this peace and calm as their defining factors; he is as yet unaware of the change that has taken place since he visited the park. In some ways, the park can be seen as a narrative instigator of Deleuzian “becoming”; where the continual transition of Thomas’ own realisation – a realisation of both the inane qualities of his life and what he has really seen in the park – becomes overt and eventually unavoidable. The park lights this Deleuzian match by playing upon that other essential quality of Deleuzian (or Bergsonian) becoming: that of intuition. The latter leads to an awareness of the former and the sound of wind rustling through the Marion Park trees becomes a strange yet haunting sonic leitmotif for this philosophical transition of the character. This is incredibly apt as the link between this idea and the character comes from a (re)engagement with the outside world, where the park and Thomas develop a symbiosis far beyond the relationship he initially perceived would be possible from his casual visit to snap a pair of lovers in the trees. The final irony of this is that such a realisation of becoming ultimately destabalises the character to the point where he eventually disappears. When the final end titles appear, Thomas fades from the park; after, of course, he has become aware of the final act of mime of his current existence, and actively bought into it by throwing the imaginary ball back. But Antonioni shows the wonderful logic of this moment as, instead of the breeze in the trees, the nondiegetic score returns, drowning out the diegetic sound just as the realisation of becoming has effectively drowned out the very reality of the main character; so much so that he fades into the grass and into the breeze.